New development on Mentawak beach has started, with a few resorts almost open. Five new locations are in the works, including one on each side of JTP and a house on the rocks between Mentawak and Juara beaches. Unfortunately not all these resorts and chalets might develop in a turtle-friendly manner, which could spell doom for the Green turtles that nest here. 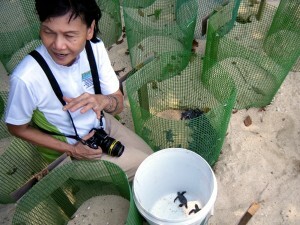 Mentawak could lose the distinction of being the last beach at a Kampung that still receives nesting turtles. We have assembled a ‘situation report’ about development on Mentawak. Click here to read it. We also have started an online petition calling for turtle-friendly development on Mentawak, which we’ll be delivering to various Malaysian government agencies. You can sign the petition here. Please leave a personalized comment to make your signature more powerful. For more info on the development continue reading below. * All maps on this page can be enlarged by clicking on them. A variety of things can accompany development: cut and cleared vegetation, more noise and light pollution, and increased nighttime activity on the beach. All of which aren’t good news for sea turtles. We’re working hard right now at JTP to get Mentawak protected and ensure the development is turtle-friendly, meaning vegetation is kept intact or not completely cleared, and noise and light reaching the beach at night is kept to a minimum. 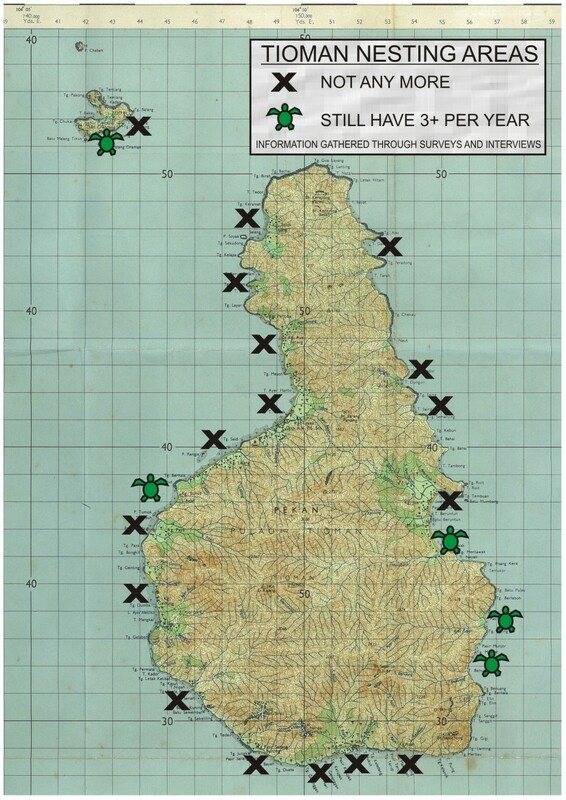 The nesting Green and Hawksbill turtles still visiting Juara, and Tioman in general, are small fractions compared to decades ago. 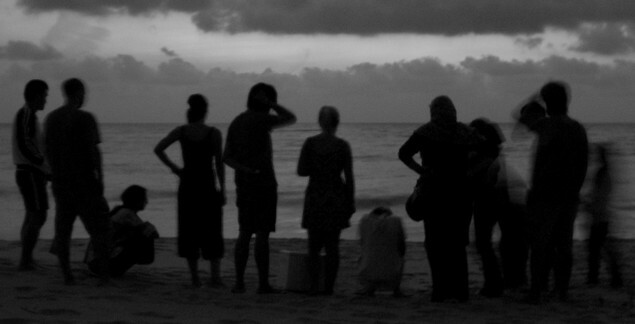 Leatherback and Olive Ridleys turtles are already extinct from Tioman, as is the case in much of Malaysia. 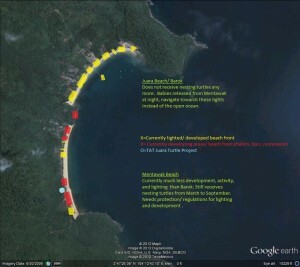 In the past, 20-30 beaches around Tioman supported nesting females and now only 4 do. Three of these beaches JTP monitors daily (Mentawak, Penut and Munjur) with the fourth being a turtle-sanctioned beach on the other side of the island (TAT Turtle Sanctuary at Benut). We don’t want Mentawak to become another “X” on the map. One option for Mentawak is to declare a Temporary Occupation of Land (TOL) on the government’s beach, which would quickly secure the beach’s nesting area. A more permanent solution is for the beach to get sanctioned as a protected nesting area, as is the case on Pulau Redang, Terengganu and the Turtle Islands, Sabah. 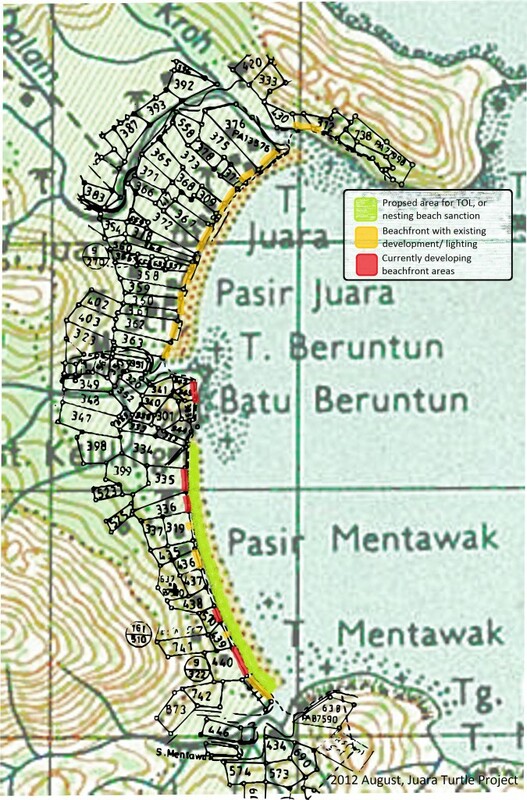 If sanctioned the land value and tourism attraction would likely increase over time in Juara instead of becoming overdeveloped like so many other beaches already have. 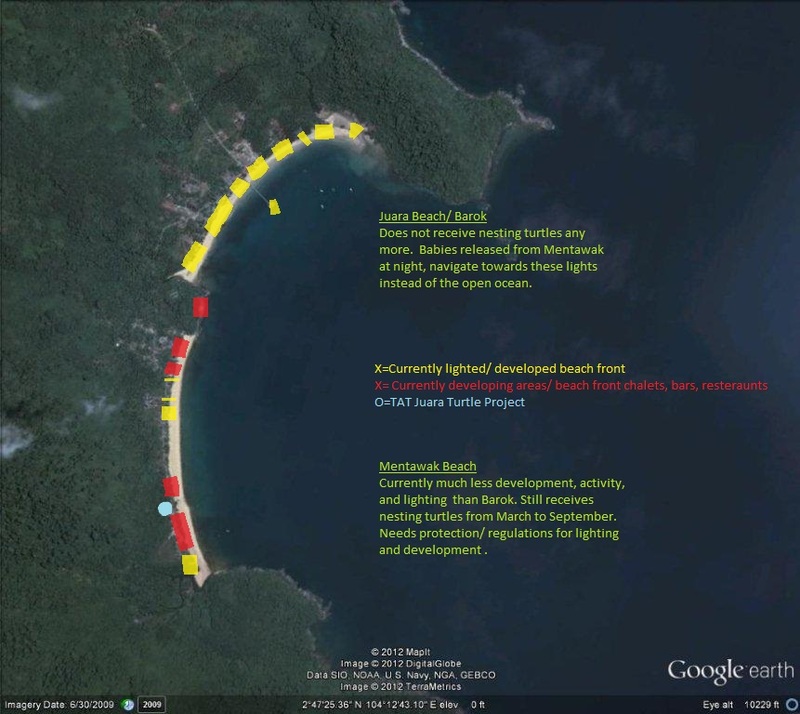 The turtles, surrounding ecosystem, Tioman tourism, resorts, business, and local culture could all benefit from making this important investment to protect Juara’s nesting beaches. The time to act is now to ensure that the nesting females of Mentawak continue to have a home and that the thousands of hatchlings released from this beach over the past 11 years have a beach to nest at in the future. End of July, got a last minute invitation to an event in Rantau Abang, with the Fisheries Dept. They gave a thank you for our work, and were also looking for all turtle project around Malaysia to contribute to their funds. Turned out to be the best Govt function Ive ever attended as I met Mr. Wee manager of Gem Island Resort. They run a hatchery at their resort because Turtles nest at the beaches. Together we had dinner with Prof Eng Chan in China Town Kuala Terengganu. 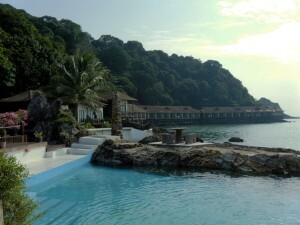 And made plans to visit the resort the next day with Mr Wee, to give some advise on their methods. 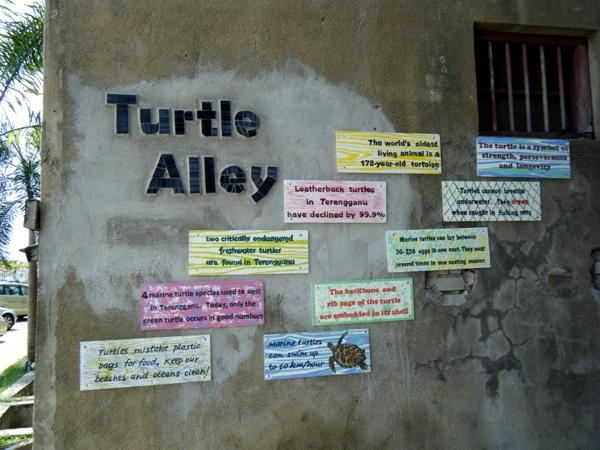 Visited Turtle Alley, also in Old China Town, KT, right by the archway. 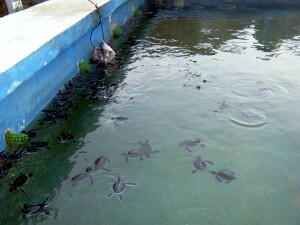 Established by Prof Chan and the Turtle Conservation Society of Malaysia. Go and check it out. Next day went to Gem Island to get a look around and give advice. Mr Wee and Gem Island Resort were very receptive to getting advice. They collect eggs from two main beaches, where eggs would be getting collected without their protection. The eggs go to their hatchery, and when born 2 months later they are put into a pool to grow up for about a week until another they are released…. not the best. This is where it was suggested they let the babies go right away, so they don’t lose energy in the pool, and don’t mix up their life cycle instincts. They totally agreed and were glad for the advise, as they had not known any better. It was great they were so open to change even after already operating for 12 years. After hatching, it’s suggested to release the babies asap from their original nest beach. Again an idea that was agreed to. Turtle friendly lights and info posters. This is a photo of our beach-front lighting supplies. The part to this lighting pack that you can’t see.. is that we will go and install the lights for anybody that will let us; including new fixtures, wiring or whatever is needed to make a better situation for the nesting Turtles. The parts you can see are some low-watt yellow lights and posters. Yellow lights have a long wave-length (almost like red lights) and Sea Turtles have a hard time seeing it, so its less intrusive for beach front lighting. 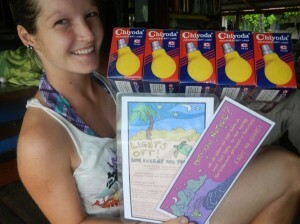 One of the posters is for inside beach-front chalets, it says “Lights Off! – save energy and turtles” and then explains how the guest can help be Turtle Friendly. The other poster is to inform guests, so that they know why their resort is using yellow lights. 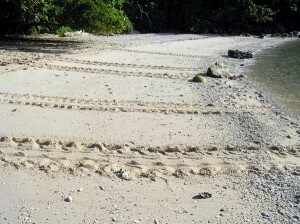 The first nest 2012, Hawksbill from Penut Beach, 140 eggs! The nesting season has started and the first nest was collected from Penut Beach, it was a Hawksbill. So we will be awaiting it return in about 14 days form now! To celebrate the occasion, to have some fun with the Turtles, and for some good food; we supported a celebration BBQ at DJ Corner here in Juara. all invited. We used a digital projector from UWCSEA to show big screen turtle videos all night.